The building dates from 1928 and was designed by the noted Lynchburg architect Stanhope S. Johnson. Truss-work and tracery are evocative of early Gothic and are executed in this space with a pronouced boldness of line. While the west end originally featured a shallow gallery with no railing or means of access, the present choir loft was a new element constructed with other alterations and additions in 2002. It is open on three sides and the front is faceted. The organ stands tall in its space and in consequence has but a modest footprint. Its sound projects well into the room from this vantage point and this enables the tonal quality to be confident while at the same time relaxed. 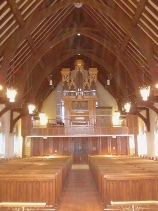 The casework of the front case is of local quarter-sawn Appalachian white oak, while the carved tracery panels - or "pipe shades" - are of Pacific yellow cedar. The front pipes in the upper part of the main case - those which are visible - are all from one stop or register: the primary one, named "Principal". They are of seventy-five percent tin, with sheen and color produced by chalk. The sense of tallness or verticality is enhanced in two ways. One is the breaking of the top cornice-line into different sections, with the visible pipes consequently grouped into different compartments. They are five in number, a time-honored arrangement; the center and outer ones being known as "towers" and the smaller ones between as "flats". The other way is the particular proportions assigned to these compartments. Inspiration in this regard was drawn from the 1490's organ in Kiedrich, Germany. In keeping with many of the earliest organs, all the mouths of the front pipes are in a single horizontal line. The top ends of the pipes thus reveal their different lengths in the most straightforward way; placing "function" ahead of "form". In the context of the visual design this characteristic lays the groundwork for the area to be covered by the pipe shades. Exact mirroring between left and right sides of the front case has been consciously avoided, and this tendency towards subtle asymmetry is pursued in numerous details throughout the organ. The pipework of the main manual division (Hauptwerk, 784 pipes), which includes the visible front pipes mentioned, is in the upper part of the front case, while that of a smaller manual division (Brustwerk, 392 pipes) is immediately above the console or keydesk. A characteristic of the front case is being closed in the back: defining its "depth" at about three and a half feet, and a factor of significance in the way the sound of its pipes is projected and heard in the room. A feature of early keyboard instruments is that certain notes near the bottom end of the keyboard were never needed for the music of the time and were not included. It was a decisive factor in the slender proportions of the towers. Even for the arranging of notes on the keyboard itself this "short-octave" tradition was often advantageous; until about 1700, when, in conjunction with changing tastes, the players of keyboard instruments began wanting the missing notes. The proportions of new organ cases changed as a result. In order not to run afoul of the missing-note police today, achieving the "ancient" proportions involves grappling with where to "plant" the pipes then omitted. In this case, three bottom-octave notes of the Principal stop (E, G and G-sharp) are placed behind the front. So the center portion of the main windchest, which from a tally of the pipes in the center tower might be thought to accomodate the six lowest notes of the keyboard, actually accomodates nine. A short distance behind the main case and mounted fairly high is a separate free-standing case known as a swell box. It contains the pipes of a third manual division (Swell, 767 pipes), which is comparable in size with the main division. The front face of the box consists of a set of 36 vertical louvers which can be opened and closed to produce a change in perceived volume of sound from the pipes inside. The walls and roof of the box are of solid wood about two inches thick. The louvers are arranged to direct the swell sound away from the center, to the outside and around the sides of the front case. Swell boxes were unheard of in gothic times. They first appeared in the 17th Century, and continued to develop over three centuries towards the form and musical purpose represented here. There are many different ways of incorporating a swell division, but certain properties seem to have crystallized as conducive to better results. One is that a swell division benefits in terms of musical usefulness if it can be set apart from the front case: it works better if the sound it produces is not too direct. At the same time this sense of remoteness doesn't want to be carried too far. Among factors which assist in optimizing this balance are putting the swell box near near the building's ceiling, and using that to reflect the sound forward. Others pertinent here are the hard shellac coating applied to the interior of the swell box, and the design of the sides and roof of the box each at one degree of angle to promote egress of the sound. The Brustwerk features a pair of double-folded doors, which can be partly or fully closed by hand. This is usually done before beginning to play, and can be useful from time to time to quieten the sound of that division. The flue pipes (those in which there are no moving parts except air itself) include instances of all the chief long-standing classical forms: open, stopped, half-stopped; cylindrical, tapered. The reed stops (those having a vibrating metal tongue) are seven in number. There is a healthy smattering of sixteen-foot stops, including three on the manuals. While the importance of the swell Contra Oboe can hardly be overstated, of significance too is the Lieblich Gedackt which is accomodated in its entirety within the swell box. In conjunction with other factors it contributes a fullness without muddiness to registrations large and small. Another stop worthy of special mention is the Brustwerk Quintadena. It is executed here with a high degree of finesse. The pipes produce a rich sound in which the fundamental pitch is matched by a bright tone at the third partial. Played alone its character may perhaps best be described as melancholy. In combination with other stops it is capable of imparting a colorful transparent resoluteness. Space has been provided on the windchests for four additional stops. (Please refer to sidebar).